LiveWatch is a great home security system, especially for those with short-term needs. Their DIY approach and fast monitoring response make for a solid first choice. If you’re looking for a home security solution that won’t break the bank, it might seem like you’ve got a tough road ahead. But fear not, because we’re doing the hard work of figuring out which companies are worth your time and money. There’s a wide world of options out there, but only a select few belong in your home, protecting your possessions and loved ones. When looking to secure your own home, your choice boils down to balancing cost and effectiveness. Which features will serve your family best? How much will it cost? Most importantly, how well does it work? We’ve been in the exact same place, asking the same questions. We bring our experience to the table in hopes of sorting out the home security system that will serve you best. We’re taking a close look at LiveWatch security to let you know about the features, reliability, cost, and overall effectiveness of the program so that you don’t have to risk your own time and savings. Things to consider before buying a home security system. Everyone wants to enjoy the peace of mind that comes with knowing their home and their loved ones are safe and secure at all times. Whether you’re just moving in, buying your first security system, or looking to make a change, we’re here to help guide the process. The ideal customer for LiveWatch is going to be somewhat comfortable working with technology, because the company offers full DIY installation in order to save costs. Additionally, a level of familiarity with smartphones and computers is beneficial, because the best features on offer will fully integrate with these devices for more comprehensive coverage. LiveWatch is also ready to embrace smart home automation. Its hardware integrates with any smart home devices you may already own, allowing you to achieve easy, comprehensive control of your home environment from anywhere with an internet connection. LiveWatch entices with affordable rates and short contract time. Their plans start at $34.95 per month for the most basic level of protection and top out at $49.95 per month with full home automation and video monitoring. Of course, all plan levels come with full, round-the-clock wireless remote monitoring by professionals. The free DIY installation is somewhat offset by an upfront equipment fee, usually between $200 – $300 but often lower thanks to discounts. The most unique selling point for LiveWatch is that their contract is only for 1 year, which is surprisingly short compared to its peers. After that, your service continues on a month-by-month basis and you can cancel anytime. Even better, if you cancel before 1 year, you can even get a full equipment refund. Let’s take a look at some pros and cons of the product. ASAPer is the name of the monitoring system that comes with LiveWatch Security systems. It aims to connect and respond faster in emergencies than the average competition. 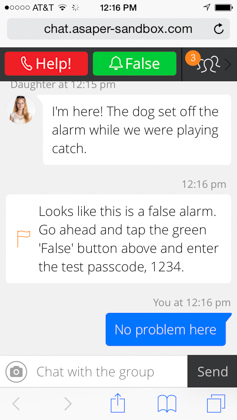 LiveWatch’s system sends you alerts instantly when an alarm has been triggered, allowing you to resolve the alarm from your smartphone or computer if there’s nothing to worry about. Of course, if you’re unavailable, the professional monitoring center dispatches the police to your home. As with any home security system, the reliability of the remote monitoring team is perhaps the single most important aspect. Reviews indicate that LiveWatch nails this feature. LiveWatch customers can cancel their service at any time with no early termination fees, although depending on your situation, you may still have to pay for your equipment. This feature stands in contrast with most of the competition, as many companies require their customers to pay the remaining balance of their contract. This fact alone makes them a great first choice for anyone looking for a home security solution because you won’t be stuck for years if you dislike the service. Even better, once the 1-year contract is done, you continue on a month-by-month basis without any further risk. 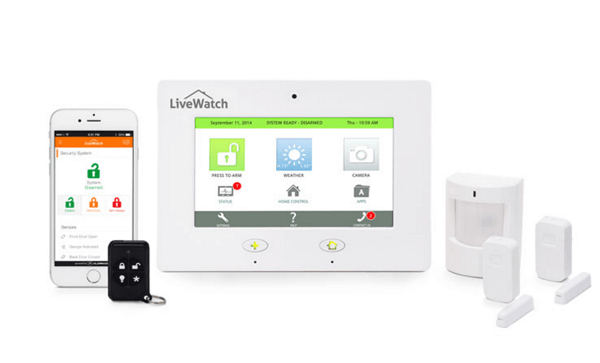 As with many of the top home security solutions available, LiveWatch offers a tier of service that includes instant, always-on remote control from your smartphone or computer. This is a serious boon for your peace of mind, allowing total command of the system from anywhere with an internet connection or a cellular signal. Of course, when at home the entire system is controlled by a central hub device mounted on your wall. Still, we know from experience how valuable it is to be able to check in on things while at work, out and about, or even on vacation. Their included smartphone app lets you know anytime a door has opened or an alarm has gone off, allowing you to reset status, turn alarms on and off, and even command your smart home devices. While LiveWatch offers a variable set of starting equipment to customers, selected based on your individual needs, they also offer the ability to add on more hardware as your home or your needs change. The system is designed to allow for expansion, with the central hub allowing up to 40 devices to be placed throughout the home, from motion detectors to window and door sensors, and even video surveillance with an additional monthly fee of $10. It’s reassuring to know that no matter what hardware package you begin with, you can expand components to make it more comprehensive. While installation is DIY, the equipment is mercifully easy to set up. “It hurts when you have to cancel service with a business you have zero complaints about. After researching a number of home security systems last year, I chose LiveWatch Security b/c of their pricing and service options. I haven’t been disappointed at all. Their customer service is great (knowledgeable, prompt, professional and friendly) and I had zero problems with the security system – and cancellation happened without any hassle. The only reason I’m canceling my service is because I’m moving to a new home that won’t require another layer of home security. But, as I told the customer service guy today – if I require the service in the future, LiveWatch will be the first company I contact.” – Shikha B. “We have had the system for about 2 months and we find it very easy to use and install. The sales team and technical support people were knowledgable, very helpful and responsive. We haven’t had much experience yet with the monitoring system response time.” – Michele G.
Vivint offers a big focus on home automation, providing quality wireless home security technology with their packages. They offer a comprehensive installation and setup process, with professional techs coming into your home to set the product up. There is a charge for this level of attention, which is aimed at homeowners who want to avoid the risks that come with working directly with the hardware. If you’re curious about the full benefits, check out Vivint right here. ADT is the most well-known name in home security. They’ve been around the longest and built up a solid reputation over the decades. ADT is known for its high level of service, including full consultation and installation. This comes with an accordingly higher price. Price: Plans go from $28.99 to $55.99 a month. The top tier plan includes remote secure video and smartphone control. Benefits: Professional installation, remote locking, ADT branded warning signs. If you’re curious about the full benefits, check out ADT right here. Frontpoint similarly focuses on DIY installation, wireless security, and smartphone access to your home security setup. They are well-known for quality customer service, all-cellular monitoring, and low costs. Price: $34.99 to $49.99 a month. All plans include 100% wireless cellular system with 24/7 professional monitoring but do not include all equipment. Features: Outdoor camera, remote app, and top plan offers video streaming, automated door locks, and advanced thermostat control. If you’re curious about the full benefits, check out Frontpoint right here. LiveWatch fits into a unique space in the home security world, offering a comprehensive level of service along with cheaper DIY installation. Their focus on instant communication and control is refreshing, as is the ability to expand the hardware as your needs grow. While plans are in the lower-middle of the pack, as far as pricing goes, the initial hardware costs could be off-putting. However, this is easily balanced by one of the most consumer-friendly contracts around, allowing you to cancel any time and to continue on a month-by-month basis once the short 1-year contract has completed. LiveWatch is an especially attractive investment for those looking to install their first home security set up with as little risk as possible.